The current ruler of the dating apps Tinder, has been in the market since 2012. It’s been in the arena since dating apps were nothing else but unpleasant platforms full of irritating advertisement pop-ups and a whole lot of bugs. Tinder has gained its position in this segment over such a short span performing most of its purpose and proving itself high enough in the eyes of dating app users. Not even just for itself but for each dating out there in the market, Tinder has been successful in regaining the trust of dating app users. No wonder why startups are searching for the dating app cost and want to hire professional developers. But How Did Tinder Become Such A Blockbuster? Besides the intuitive design, the app leveraged on various captivating features just like the handy swipe thing and the GPS discovery option. These have helped it gain its position all of a sudden. But are you aware of Tinder’s success figures? Let’s just have a quick roundup. These majestic features have inspired a lot of business owners and newbies to bring up their own version of this remarkable app. And I can feel that you are also pretty interested in building such an app and also looking for dating app cost. But before you jump into the action, let’s have a detailed talk about the tech behind such groundbreaking dating apps. And which can ultimately determine the cost to make an app like Tinder. Tinder is old news when it comes to dating apps. Bumble, Hinge, Dine and even Facebook’s newest dating introduction is taking the world by storm. Startups are focusing on solving user problems by going niche, making ‘actual’ dates happen and increasing networking as well. And when it comes to technology, how can we forget AI and VR? Yup, artificial intelligence will certainly rule 2019 and beyond when it comes to dating app development. AI research is improving and dating app developers are particularly incorporating AI in dating apps. Having said that, there are other platforms which will flourish in future and will also determine dating app cost. Let’s talk about those in details. Dating apps like Hinge and Coffee Meets Bagel contains a video chat option which lets you video chat with your match and date virtually to avoid disappointments. Almost 44% of online dating service users have reported of getting disappointed after meeting their match offline. And this is where virtual dates come into action. This is becoming a new trend as some of the dating apps are providing inbuilt video call as an option. Ever played Garfield GO or Pokemon GO? If yes, then I guess you already know how augmented reality tastes like. Dating in AR is much similar to these games. It’s just that in this you have to catch dates instead of Pokemon. Sounds fun, doesn’t it? Flirtar is the first AR dating app to step into the market. It’s a lot similar to a dating app, Happn, but in Flirtar you would see your familiar surrounding with balloon markers. Just a click on a balloon and a new profile opens up. Now it’s all up to you. You can either start the first move if they like you back or just approach them in person if they are nearby. Virtual Reality has been one of the most appreciated innovations of modern day technology and its potential has just started getting explored in the near past. A dating app named VRchat that builds up a virtual space for dates where the user can communicate with anyone all over the world visualizing as if they are in the very same room. This tech makes romantic blind dates possible though virtually. Dating in Virtual Reality is more efficient. It helps to develop meaningful connections avoiding the fake profiles. With VR you can even have romantic dates without even stepping out of your home. It even makes group dates possible. I know that nothing else can replace physical presence, though this concept of dating in VR is definitely promising a better future. VR tech has brought a new for young couples who hope that in the near future they’ll be able to transmit hugs and handholding physical sensations, though virtually. But have you thought about the moolahs that building an app like tinder would get fetched from your pocket? I guess you haven’t but you’re looking for dating app cost. So, let’s talk about the cost of making an app like Tinder. 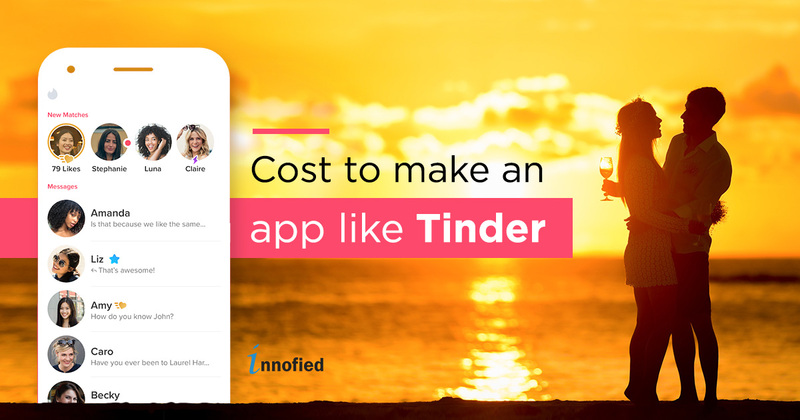 There are few things that determine the cost to develop an app like Tinder. We are going to get in details with every points. So, get started with your calculations. Choosing a platform to build your app is where things start from. You need to choose things wisely as the time and cost depend highly on the type that you choose. The first and foremost thing you need to do is choosing a platform for your app development. This choice should be done wisely as the cost and duration of the app development depends highly on the number and types of development platforms you decide. For a Tinder like app, you require an efficient admin backend team that will help you look at the stats and judge the performance depending on various user engagements. This analytics would contain the activities and events (the number of matches or swipes make each hour). These provide ample data to understand user trends, traits, and tendencies. To get the best out of it, the admin panel must be equipped with tools as Crashlytics and Google analytics. Best tools and resource will add up to the dating app cost. To make an app like Tinder, you must have extensions to act as the source of the database to cumulate all the information that users would refer to. It could be any data regarding a user or regarding the demographics that help to connect with some matching records to get valid information that you are looking for. Though the efforts may vary depending on the features that you have chosen. Post completing the designing and development phase, the app has to face the testing and debugging phase to make sure its quality is top notch. Post completing these phases the app gets ready to be launched to the app stores. To make a tinder like dating app requires a good level of experience working with various social, communication and analytical features. Other than that, the team engaged with the development phases should have adequate knowledge about integrating third-party resources and extensions which would help to extend the functionality of the app according to your choices. It would also require adequate support when it comes to infrastructural resources to attain the best results. Moreover, if you talk about different expertise, technical skills and knowledge to accomplish various tasks that come forward developing the app here is a list of resources and their efforts marked distinctly. For a better resource-time-cost view, I have tried to break it down below. Here I have jotted down the details of the cost and duration required to develop an app like Tinder. 1 Graphic Designer would be required to work on the personalized graphics and layouts. Charges $20-$25 per hour. Time required- 50-60 hours. 1 UX Designer would be required to find the scopes of designing. They would create the entire wireframe and the communication interface. Charges $25-$30 per hour. Time required- 80-100 hours. 2 Programmers would be required on each platform to build the entire software design and to work on backend programming, extension development, and deployment depending on the entire scope of development. Charges $25-$30 per hour. Time required- 500-600 hours. Depending on the efforts, resources, and duration of the app development phase, a cumulative approximate number can be attained representing the overall dating app cost. Now, if we consider working on a single platform (say, iOS) and a single resource per expertise, then the cumulative hours would range from 750 to 950 hours. Summing up another developer’s effort to the total duration would range between 1350-1650 hours. While the development time would range between 5 to 6 months considering all resources are giving their full effort on the project. Related read: How Much Does An App Cost? Considering rates applied to different resources, it may range between $25-$30. Say, if we consider involving two programmers then the dating app cost would be somewhere around $20k to $50k for developing an app for a single platform. All these above-mentioned numbers are based on the worldwide averages taken from various countries. These numbers can swing up to 30-40% on, either way, depending on the profiles of the people involved. And this isn’t it. Dating app builders are planning it big by introducing innovative features to their apps taking it to a whole new level. Want To Build Your Own Tinder Like App? Tinder has paved a way for the startups to make it big in the online dating app segment. And this is what you should look forward to. And if you are reading this I guess, you are already into it. Despite this market being much promising, we haven’t seen any app coming up with something innovative. This makes a chance for you to make a mark in this segment. Still, have doubts? Alright, no need to panic, we have your back. All you need to do is giving us a call. If you have a dating app idea, we’ll build it better than Tinder. Innofied is there for you.